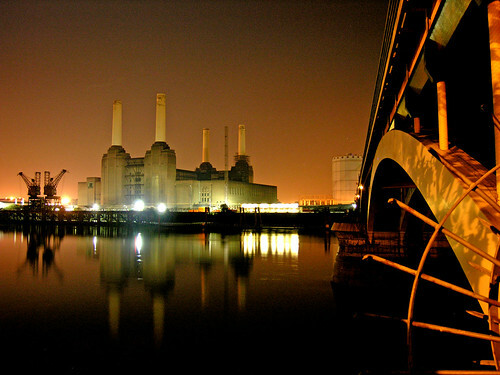 While taking this series of shots of Battersea Power Station in the early hours a police car pulled up on Grosvenor Road and two officers, one female, one male got out. They told me that they were stopping me under the Prevention of Terrorism Act and asked what I was doing. "Battersea Power Station," I said. "Would you like to see some." "Yeah," I said, handing her my driver's licence... "what do you need that for?" "If we stop anyone under the Prevention of Terrorism Act we have to fill in some paperwork. Do you have any possessions?" "Here's your copy of the form," she said, handing it to me. "Nice chatting to you. You can carry on if you like." "Thanks," I said. "Have a good evening." I've got the form here. Stop Code: B = To check personal details/documents. Search started 12.55am. Search ended 12.57. Male seen taking photos of powerstation. Vicinity of bridges, within government security zone. Stopped under terrorism act. They were both lovely and chatty. It was a surprisingly friendly and untroubled exchange. If either of them have popped along to see if the photos have been posted: Hello!